Once upon a time we received a commission to work in a kindergarten, in the reception area and administration office. We had to remodel it in a visible, efficient and economical way, almost as always. We observed the space to be rebuilt looking for some authentic traces related to the industrial past of the building, before it got converted into a kindergarten. And it was our lucky day: above the dropped ceiling in the central area not only did we discover a gorgeous structure of flat-ached vaults, but also a skylight and a part of another one that had been there for years without being able to give out its light. From that point on everything got easy: we had the volume, we had the light… the only thing we were missing was colour. Thinking of the lighting and the colour of the space we had gained, we stared drawing the kids’ sky: a place where innocence and brightness get stained with hues of games and the sound of laughter. We designed lamps for the vaults as built-in luminaria lights in the upper part of the wall. 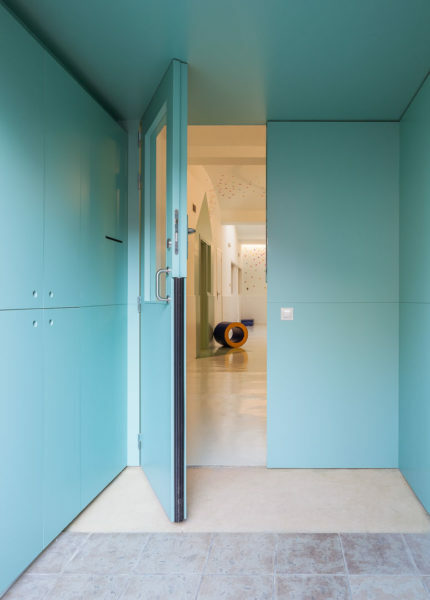 And we chose a bright sky-blue colour to cover all the surfaces that had already existed. And while this hue lets us have our head in the clouds, the randomness of kids’ games and movements makes us keep our feet on the ground. So, with two decisions that enabled us to transform the space – we took off the dropped ceiling and added three layers of paint – we all lived happily ever after.